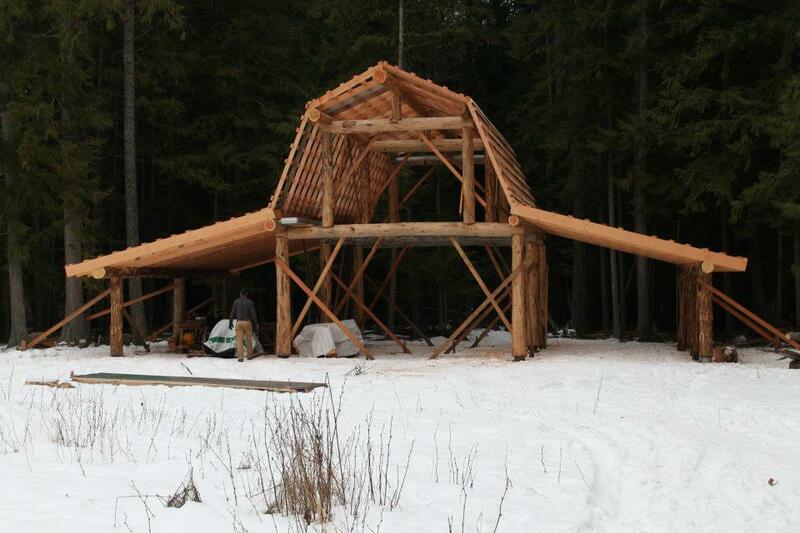 Rob Wilkes is doing a nice job building this log post and beam barn! About a year ago I helped him design the structure and since then he has been working on it in his spare time. 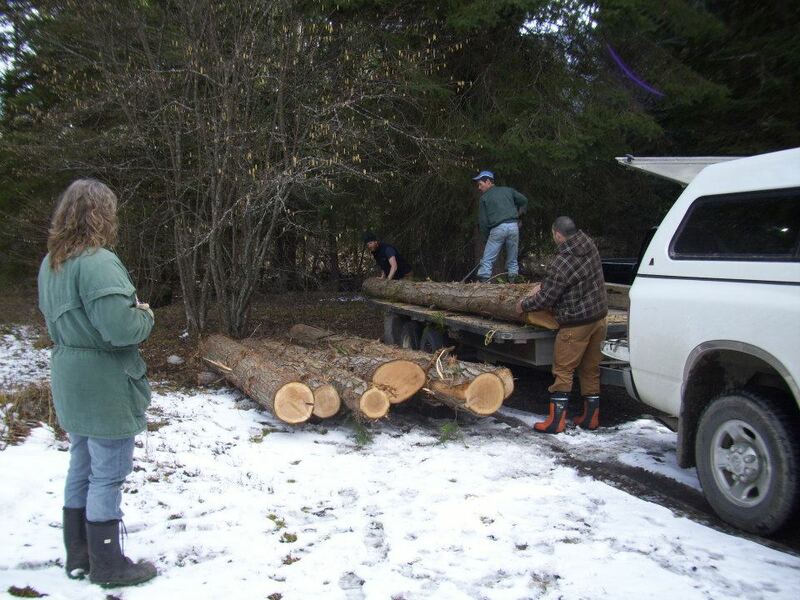 He selectively harvested trees from his property in Cooper Creek, peeled and notched the logs on site and finished the post and beam structure with dimensional lumber from the local sawmill. The plans for this beautiful Barn are now available! Purchase a set of blueprints for this post and beam structure easily through Paypal via the button below. After payment I will email you the set of plans in PDF format that you can print on Tabloid (11″x17″) or A3 format. (If your printer does not take that size paper, plans can be printed off on a regular printer on a smaller scale.) Plans will be emailed to the email address on your PayPal receipt, usually within 24 hours. Please contact me if you have any questions prior to purchasing as there will be no refunds once the PDF has been sent. Thank you & may you be inspired and build a beautiful barn!! 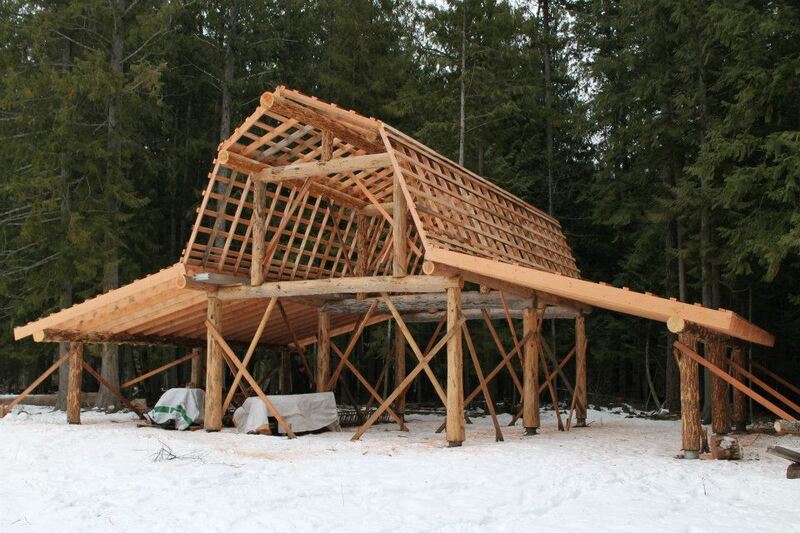 This entry was posted in Local building materials, Log building, Natural Building, Timber Framing. Bookmark the permalink. I was wondering, if i could get a Drawing with size and dimensions on the bautiful barn. I Might build one here in Denmark. If Its possible and i am going to build it, i Will send pictures under construction. Thank you for your inquiry. These plans are available for a fee. I’ll send you an email with the details. It would be cool to see a barn like this in Denmark! What is the fee to receive these plans? I may be interested. what are the posts setting on? Hi Randal, the posts sit on concrete sono tubes. Hi Brandon, the plans are available for $100. Please send me an email I can send the plans (in pdf format) to. Thanks! Hello, I was wondering if you could send me a link to purchase the plans for the post and beam barn shown above? it would be greatly appreciated. I have recently researched hewing timber for barn building. Now that I see this structure (main whole log framework) I realize this is not only structurally sound and aesthetically pleasing (hand peeled) it requires no hand hewing. I have mature trees to harvest for this project. I need to research more into drying timber or building with green wood. Does your plan for this structure include details for the log connections, are they drilled and pinned, complete with finished details? I have developed an image in mind of the complete barn that Rob has built and feel confident I can do this project also. The plans for the log barn on offer show the layout and dimensions for the bents, walls, roof and floor plans. Some framing details are provided by connection descriptions. It is assumed that the builder possesses fairly good carpentry skills, but the connections are very basic and mostly held together with ardox spikes. 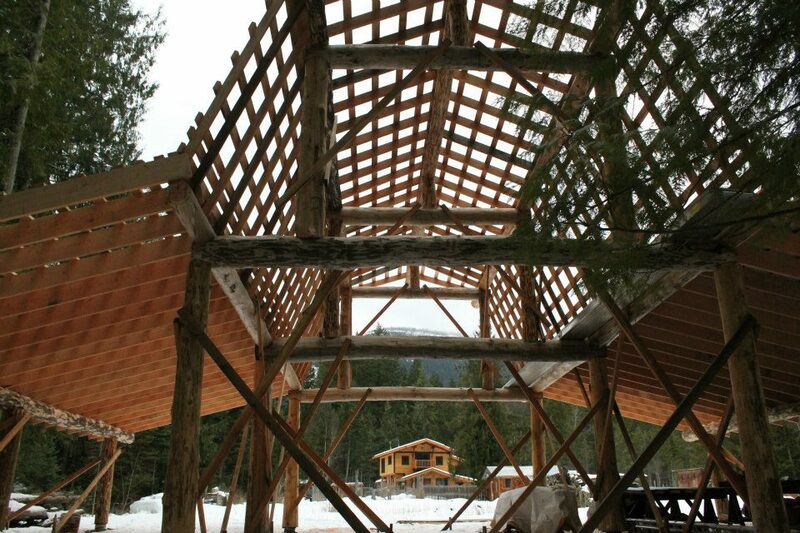 Also the envelope is not shown in the plans but can be added quite easily by wrapping or infilling the frame with 2x framing or strawbale or cob or whatever. Some room for your own creativity! You can see some more pictures of the barn here and here.